Exclusive use for Swingline High Capacity Electric Stapler, #69270. Cartridge staples up to 5,000 times without reloading for time and money savings. Ultimate convenience. Flat clinch design neatly fastens from 2 - 70 sheets of 20 lb. paper. Sharp chisel point delivers better penetration and less jamming. 5,000 staples per cartridge. 3/8" leg length. Welcome to MyBinding video. 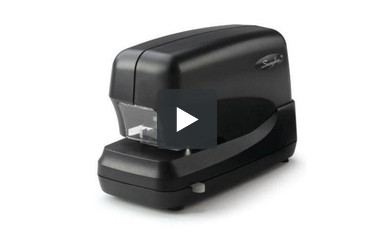 Let's have a look at a High Capacity Electric Stapler by Swingline. This is a simple and straightforward desktop stapler. It's quick, efficient, and easy to use, and the small knob below allows you to adjust the margin a little. Suction feet on the bottom keep it from moving around on the desktop. Adding staples is simple with pushing the button on the back and lifting the lid. The green button on the inside releases the old cartridge and you can replace it with the new. It's always good to thread the first few staples off on the new roll before you put it in. Be sure to press the cartridge all the way in until it clicks. This stapler comes with a cartridge already in it with 5,000 staples. Replace the lid, thread the bottom if you need to just to bring staples forward, try on some scrap paper, and you're ready to go. And that is Swingline's High Capacity Stapler. For more demos, reviews, and how-tos, check out MyBinding.com. What staples do I order for the Swingline 520e electric stapler. Will this cartridge work in a Swingline 270? Do you accept purchase orders? Yes these do work with model 270. You can purchase the item off our website by clicking the add to cart button. I have a swingline 5000 cartridge stapler, I need to buy a new cartridge? The Swingline® 5000 stapler has been discontinued the Standard Staple Cartridge (S7050050) should be compatible. I need a 5000 cartridge swingline #50050 model # 69001. The Cartridge Electric Stapler (S7069001) uses cartidge staples number S7050050.